INTER.FEAR by Hansel Nezza & Athena Mazarakis from MARABULA on Vimeo. El 6 de julio la pieza INTER.FEAR, de Hansel Nezza y Athena Mazarakis, ha sido seleccionada y será estrenada en el Main Programme del National Arts Festival de Grahamstown, Sudáfrica. Una pieza documentada y creada entre Berlín, Barcelona y Johannesburgo. Inter.Fear is an artistic co-production between South African choreographer and performer, Athena Mazarakis, and Hansel Nezza, choreographer, performer and artistic director of MARÀBULA barcelona • berlin. Their collaboration creates an immersive theatrical encounter that delves into that most basic, common and essential human emotion: fear. Inter.Fear weaves together a raw physicality with an evocative stage design and cutting edge interactive digital art to explore the constant and insidious presence of fear in our contemporary lives – a presence that mediates and interferes with our every encounter. The material for the work is sourced and researched across three cities: Barcelona, Berlin and Johannesburg. Inter.Fearhowever looks beyond the triggers of fear specific to each of these particular socio-political contexts. Instead, through the poetic universe created, it enters the fabric and texture of fear inhabited by bodies across these cities. Bodies that are biologically hard-wired to respond to danger, to threat, to the unknown, to the shadow. Bodies trapped in states of fearfulness, bodies that struggle to connect because of this ‘inter.fearance’. Mazarakis and Nezza, inspired by a global context in which our most basic human reactions and biological hardwiring are so often and so easily manipulated, submerge themselves in this space of ‘inter.fearance’, to bring you a provocative and unnerving piece of theatre where the characters are unable to switch off the fear mechanism. Tegan Bristow’s breathtaking interactive digital interfaces alongside Jenni-lee Crewe’s sparse poetic stage design and Liannallull and Nezza’s haunting score combine to draw the audience into the twilight spaces of the psyche where their fears reside. Inter.Fear, as presented by the National Arts Festival, emerges out of a shorter work originally commissioned by, and presented at, Dance Umbrella 2012. The initial phase of Inter.Fear was generously supported by Dance Umbrella 2012, the Goethe-Institut South Africa and the Embassy of Spain in South Africa: Mzansicultura. The new creation by Angeles Ciscar and Hansel Nezza will be premiered in the PLATAFORMA Iberoamerikanisches Festival, in the Üferstudios Berlin, the next 13th of October 2011. In Cenital the poetical world discovered in Cámara Oscura is transformed into a stage code version. The observed, the one who helps from outside, the one who inspires, the change, the one who is affected, the falling… The visitors enter an intimate space where the unstoppable deconstruction of the character is unfolding. Cenital is a performance piece that combines movement, video projection and live music by Liannallull. A kaleidoscope built live on stage, reflecting on the deconstruction of identity; a visual game that shows different points of view around the same situation in a sensitive and intimate world. This creation is the stage evolution of the interactive installation piece Cámara Oscura, presented in Mercat de les Flors Barcelona. A MÁRABULA barcelona • berlin & Escena Digital coproduction. With the collaboration of LAPOCAFARINA PRODUCCIONS, ATENEU SANT CELONI, ÜFERSTUDIOS BERLIN, INSTITUT RAMON LLULL. Thanks to: STUDIO 44, La Casa Espinach-Capacés, Meritxell Checa, Litsa Kiousi, Milena Meyer, C.C. El Sortidor, El CuencO, Troca Teatre, PLATAFORMA Iberoamerikanisches Festival. Es un workshop abierto a performers, bailarines, actores, músicos, escenógrafos para trabajar y profundizar en el estudio de la fisicalidad, romper el patrón físico que encarcela al intérprete, descubrir un nuevo cuerpo dúctil, un cuerpo creativo, abierto al juego escénico. Explorar la disponibilidad del cuerpo a dibujar y componer el espacio. A través de un trabajo de improvisacion y composición, combinado con herramientas de teatro físico, Contact Improvisation y un entrenamiento físico guiado (base yoga). El workshop se desarrolla tanto en un espacio cerrado, studio, como en un espacio abierto. Explorando, hacia el final del taller, el espacio público como espacio performativo. Abierto a performers, bailarines, actores, músicos, escenógrafos. Workshop opened to performers, dancers, actors, musics and scenographs, focused and to deepen in the study of physicality, breaking the physical patterns that imprisons the performer, discover a body ductile, creative, open to the scenic game.Explore the possibilities of the body to compose and draw in the space. Through a work of improvisation and composition, combining physical theater tools, Contact Improvisation and a guided physical training (yoga base). Founder of MARABULA barcelona • berlin where works as artistic director and performer. Diplomated in Performing Arts at Estudis de Teatre Barcelona, based on Jacques Lecoq’s pedagogy (Stefan Metz, Merche Ochoa, Hans Richter, Montse Bonet, Berty Tobías, Lilo Baur). Drama with Manuel Lillo and Txiqui Berraondo and with Argentinean director Javier Daulte. Movement and Space Dynamics Laboratory Studio with Ángeles Císcar. Also formed with Cia. Raravis, Iñaki Azpillaga and Germán Jáuregui (Vandekeybus/Última Vez), Frey Faust, Kirstie Simson, David Zambrano, Susan Klein and Jordi Cortés. Workshops with Juan Kruz de Garaio Esnaola, Jeremi Nelson, Julyen Hamilton and Meg Stuart/Damaged Goods among others. Joined Siamb in the creation of pieces with an intense physicality with Ramon Roig and Linn Johansson. Artistic director of Taller22 Barcelona, space for arts creation and experimentation. Joins the street artistic intervention project PIPOLJAFDEPOUER, by Anna Capacés. From 2007 works between Barcelona and Berlin. 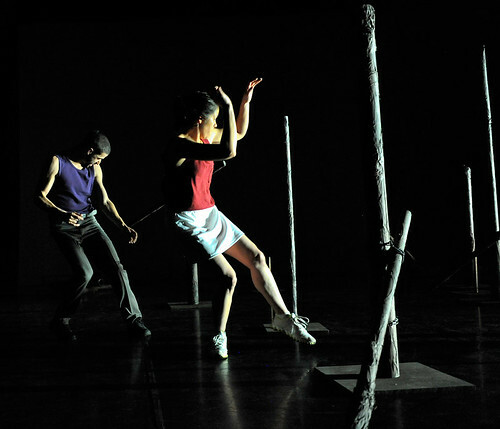 Works in the production FROM TO by Davide Camplani|Sasha Waltz & Guests. Since 2009 working with Constanza Macras|Dorky Park. 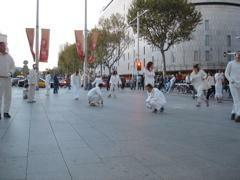 His last piece, CAMARA OSCURA, was presented January 2011 at Mercat de les Flors, Bcn. Hansel Nezza does workshops for the cie MARÀBULA, for several companies, and in Spain, Germany, Mozambique and SouthAfrica. Diplomated in Performing Arts at Estudis de Teatre Barcelona, based on Jacques Lecoq’s pedagogy (Stefan Metz, Merche Ochoa, Berty Tobías Peter Gadish, Anne Dennis). Drama with Manuel Lillo and Txiqui Berraondo/ Workshop Stage creation with Stefan Metz and Lilo Baur. / Voice with Anna Subirana. ( 1997-2001). Co director of Taller22 Barcelona, space for arts creation and experimentation. Workshop with Julyen Hamilton. Space and silence at l’Animal a l’esquena / Actor in front of the camara with Esteve Rovira. Direction in the scenic dramaturgy with Magda Puyo. (2009-2011). 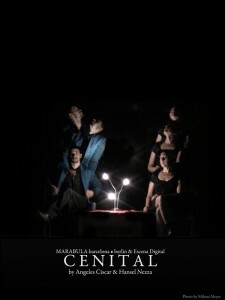 Performing with Unics Produccions at Poliorama, teatre-forum with Teatracció, with fonds from the Diputació de Barcelona, performances at C.C.C.B, Hangar… among others. Musician in Kitou and Liannallull. Directs the pieces Bienvenido Fernandito, Coses de parella? and the documentary Pipoljafdepouer, about the project developed through several happenings in the street, among others. Theater teacher and pedagog, directs in Sant Celoni the pieces El Pacte and La cua (2009-2011). Convocatoria de video danza para el festival PLATAFORMA que se prepara en Octubre en Berlin. SurReal convoca a artistas de origen Iberoamericano, residentes en cualquier parte del mundo a participar con obras de videodanza. Los videos ganadores serán seleccionados por un jurado internacional y proyectados en octubre de 2011 en los Uferstudios. SurReal es el segmento de videodanza de Plataforma, encuentro iberoamericano en Berlin. pasará a hacer parte del archivo de SurReal.